In the coming years, thousands of satellites, several next-generation space telescopes and even a few space habitats are expected to be launched into orbit. Beyond Earth, multiple missions are planned to be sent to the lunar surface, to Mars, and beyond. As humanity’s presence in space increases, the volume of data that is regularly being back sent to Earth is reaching the limits of what radio communications can handle. For this reason, NASA and other space agencies are looking for new methods for sending information back and forth across space. Already, optical communications (which rely on lasers to encode and transmit information) are being developed, but other more radical concepts are also being investigating. These include X-ray communications, which NASA is gearing up to test in space using their XCOM technology demonstrator. A team of researchers in the UK have observed matter falling into a black hole at 30% the speed of light. This is much faster than anything previously observed. The high velocity is a result of misaligned discs of material rotating around the black hole. In addition to being the largest and most massive planet in our Solar system, Jupiter is also one of its more mysterious bodies. This is certainly apparent when it comes to Jupiter’s powerful auroras, which are similar in some ways to those on Earth. In recent years, astronomers have sought to study patterns in Jupiter’s atmosphere and magnetosphere to explain how aurora activity on this planet works..
For instance, an international team led by researchers from University College London recently combined data from the Juno probe with X-ray observations to discern something interesting about Jupiter’s northern and southern auroras. According to their study, which was published in the current issue of the scientific journal Nature – Jupiter’s intense, Jupiter’s X-ray auroras have been found to pulsate independently of each other. The study, titled “The independent pulsations of Jupiter’s northern and southern X-ray auroras“, was led by William Richard Dunn – a physicist with the Mullard Space Science Laboratory and The Center for Planetary Science at UCL . The team also consisted of researchers from the Harvard-Smithsonian Center for Astrophysics (CfA), the Southwest Research Institute (SwRI), NASA’s Marshall Space Flight Center, the Jet Propulsion Laboratory, and multiple research institutions. 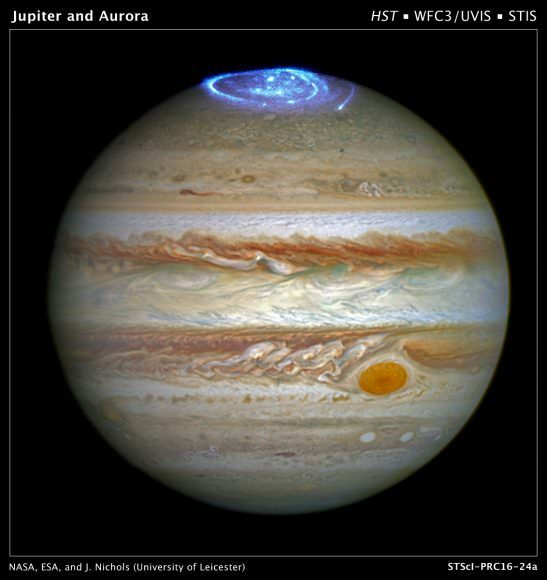 As already noted, Jupiter’s auroras are somewhat similar to Earth’s, in that they are also the result of charged particles from the Sun (aka. “solar wind”) interacting with Jupiter’s magnetic field. Because of the way Jupiter and Earth’s magnetic fields are structured, these particles are channeled to the northern and southern polar regions, where they become ionized in the atmosphere. This results in a beautiful light display that can be seen from space. In the past, auroras have been spotted around Jupiter’s poles by NASA’s Chandra X-ray Observatory and by the Hubble Space Telescope. Investigating this phenomena and the mechanisms behind it has also been one of the goals of the Juno mission, which is currently in an ideal position to study Jupiter’s poles. With every orbit the probe makes, it passes from one of Jupiter’s poles to the other – a maneuver known as a perijove. For the sake of their study, Dr. Dunn and his team were forced to consult data from the ESA’s XMM-Newton and NASA’s Chandra X-ray observatories. This is due to the fact that while it has already acquired magnificent images and data on Jupiter’s atmosphere, the Juno probe does not have an X-ray instrument aboard. Once they examined the X-ray data, Dr. Dunn and his team noticed a difference between Jupiter’s northern and southern auroras. The X-ray observations were conducted between May and June of 2016 and March of 2017. Using these, the team produced maps of Jupiter’s X-ray emissions and identified hot spots at each pole. The hot spots cover an area that is larger than the surface area of Earth. By studying them, Dr. Dunn and his colleagues were able to identify patterns of behavior which indicated that they behaved differently from each other. Naturally, the team was left wondering what could account for this. One possibility they suggest is that Jupiter’s magnetic field lines vibrate, producing waves that carry charged particles towards the poles. The speed and direction of these particles could be subject to change over time, causing them to eventually collide with Jupiter’s atmosphere and generate X-ray pulses. And as Graziella Branduardi-Raymont- a professor from UCL’s Space & Climate Physics department and another co-author on the study – indicated, this research owes its existence to multiple missions. However, it was the perfectly-timed nature of the Juno mission, which has been in operation around Jupiter since July 5th, 2016, that made this study possible. Composite images from the Chandra X-Ray Observatory and the Hubble Space Telescope show the hyper-energetic x-ray auroras at Jupiter. Credit: X-ray: NASA/CXC/UCL/STScI/W.Dunn et al. Looking ahead, Dr. Dunn and his team hope to combine X-ray data from XMM-Newton and Chandra with data collected by Juno in order to gain a better understanding of how X-ray auroras are produced. The team also hopes to keep tracking the activity of Jupiter’s poles for the next two years using X-ray data in conjunction with Juno. In the end, they hope to see if these auroras are commonplace or an unusual event. In the coming decade, the ESA’s proposed JUpiter ICy moons Explorer (JUICE) probe is also expected to provide valuable information on Jupiter’s atmosphere and magnetosphere. Once it arrives in the Jovian system in 2029, it too will observe the planet’s auroras, mainly so that it can study the effect these have on the Galilean Moons (Io, Europa, Ganymede and Callisto). Astronomers have long understood that there is a link between a star’s magnetic activity and the amount of X-rays it emits. When stars are young, they are magnetically active, due to the fact that they undergo rapid rotation. But over time, the stars lose rotational energy and their magnetic fields weaken. Concurrently, their associated X-ray emissions also begin to drop. Interestingly, this relationship between a star’s magnetic activity and X-ray emissions could be a means for finding potentially-habitable star systems. Hence why an international team led by researchers from Queen’s University Belfast conducted a study where they cataloged the X-ray activity of 24 Sun-like stars. In so doing, they were able to determine just how hospitable these star systems could be to life. This study, titled “An Improved Age-Activity Relationship for Cool Stars Older than a Gigayear“, recently appeared in the Monthly Notices of the Royal Astronomical Society. Led by Rachel Booth, a PhD student from the Astrophysics Research Center at Queen’s University Belfast, the team used data from NASA’s Chandra X-ray Observatory and the ESA’s XMM-Newton to examine how the X-ray brightness of 24 Sun-like stars changed over time. To understand how stellar magnetic activity (and hence, X-ray activity) changes over time, astronomers require accurate age assessments for many different stars. This has been difficult in the past, but thanks to mission like NASA’s Kepler Space Observatory and the ESA’s Convection, Rotation and planetary Transits (CoRoT) mission, new and precise age estimates have become available in recent years. In short, of the 24 stars in their sample, the team found that 14 had X-ray emissions that were discernible. From these, they were able to calculate the star’s ages and determine that there was a relationship between their longevity and luminosity. Ultimately, this demonstrated that stars like our Sun are likely to emit less high-energy radiation as they exceed 1 billion years in age. And while the reason for this is not entirely clear, astronomers are currently exploring various possible causes. One possibility is that for older stars, the reduction in spin rate happens more quickly than it does for younger stars. Another possibility is that the X-ray brightness declines more quickly for older, more slowly-rotating stars than it does for younger, faster ones. Regardless of the cause, the relationship between a star’s age and its X-ray emissions could provide astronomers and exoplanet hunters with another tool for gauging the possible habitability of a system. Wherever a G-type or K-type star is to be found, knowing the age of the star could help place constraints on the potential habitability of any planets that orbit it. When massive stars reach the end of their life cycle, they explode in a massive supernova and cast off most of their material. What’s left is a “milliscond pulsar”, a super dense, highly-magnetized neutron star that spins rapidly and emit beams of electromagnetic radiation. Eventually, these stars lose their rotational energy and begin to slow down, but they can speed up again with the help of a companion. According to a recent study, an international team of scientists witnessed this rare event when observing an ultra-slow pulsar located in the neighboring Andromeda Galaxy (XB091D). The results of their study indicated that this pulsar has been speeding up for the past one million years, which is likely the result of a captured a companion that has since been restoring its rapid rotational velocity. Typically, when a pulsars pairs with an ordinary star, the result is a binary system consisting of a pulsar and a white dwarf. This occurs after the pulsar pulls off the outer layers of a star, turning it into a white dwarf. The material from these outer layer then forms an accretion disk around the pulsar, which creates a “hot spot” that radiates brightly in the X-ray specturum and where temperatures can reach into the millions of degrees. The team was led by Ivan Zolotukhin of the Sternberg Astronomical Institute at Lomonosov Moscow State University (MSU), and included astronomers from the University of Toulouse, the National Institute for Astrophysics (INAF), and the Smithsonian Astrophysical Observatory. The study results were published in The Astrophysical Journal under the title “The Slowest Spinning X-Ray Pulsar in an Extragalactic Globular Cluster“. As they state in their paper, the detection of this pulsar was made possible thanks to data collected by the XMM-Newton space observatory from 2000-2013. In this time, XMM-Newton has gathered information on approximately 50 billion X-ray photons, which has been combined by astronomers at Lomosov MSU into an open online database. Based on a total of 38 XMM-Newton observations, the team concluded that this pulsar (which was the only known pulsar of its kind beyond our galaxy at the time), is in the earliest stages of “rejuvenation”. In short, their observations indicated that the pulsar began accelerating less than 1 million years ago. This conclusion was based on the fact that XB091D is the slowest rotating globular cluster pulsar discovered to date. The neutron star completes one revolution in 1.2 seconds, which is more than 10 times slower than the previous record holder. From the data they observed, they were also able to characterize the environment around XB091D. For example, they found that the pulsar and its binary pair are located in an extremely dense globular cluster (B091D) in the Andromeda Galaxy – about 2.5 million light years away. This cluster is estimated to be 12 billion years old and contains millions of old, faint stars. It’s companion, meanwhile, is a 0.8 solar mass star, and the binary system itself has a rotation period of 30.5 hours. And in about 50,000 years, they estimate, the pulsar will accelerate sufficiently to once again have a rotational period measured in the milliseconds – i.e. a millisecond pulsar. Thanks to this study, and the mathematical tools the team developed to find it, astronomers will likely be able to revisit many previously-discovered objects in the coming years. Within these massive data sets, there could be many examples of rare astronomical events, just waiting to be witnessed and properly characterized. Since it was launched on July 23rd, 1999, Chandra has been NASA’s flagship mission for X-ray astronomy. And this past week (on Thurs. March 30th, 2017), the Observatory accomplished something very impressive. Using its suite of advanced instruments, the observatory captured a mysterious flash coming from deep space. Not only was this the deepest X-ray source ever observed, it also revealed what could be an entirely new phenomenon. Located in the region of the sky known as the Chandra Deep Field-South (CDF-S), this X-ray emission source appeared to have come from a small galaxy located approximately 10.7 billion light-years from Earth. It also had some remarkable properties, producing more energy in the space of a few minutes that all the stars in the galaxy combined. Originally detected in 2014 by a team of researchers from Penn State University and the Pontifical Catholic University of Chile in Santiago, Chile, this source was not even detected in the X-ray band at first. However, it quickly caught the team’s attention as it erupted and became 1000 brighter in the space of a few hours. At this point, the researchers began gathering data using Chandra’s Advanced CCD Imaging Spectronomer. Thousands of hours of legacy data from the Hubble and Spitzer Space Telescopes was then consulted in order to determine the location of the CDF-S X-ray source. And though scientists were able to determine that the image of the X-ray source placed it beyond any that had been observed before, they are not entirely clear as to what could have caused it. 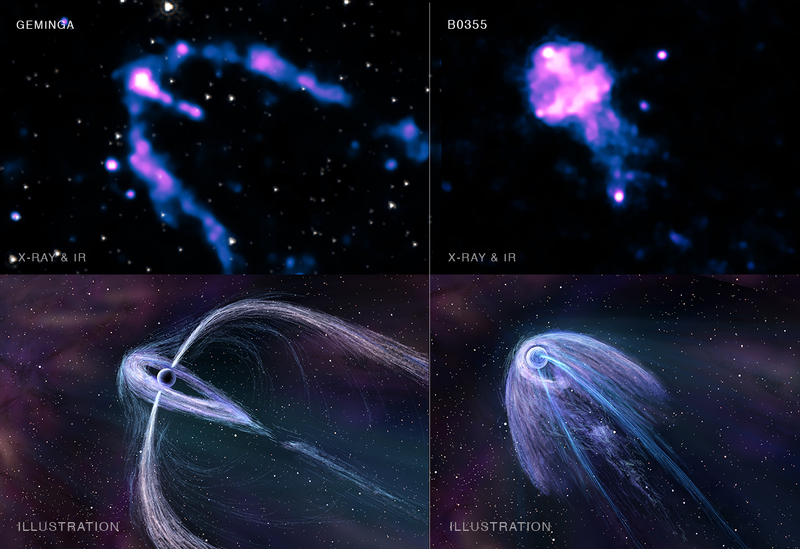 X-ray (left) and optical (right) images of the space around the X-ray source, made with Chandra and the Hubble Space Telescope, respectively. Credit: NASA/CXC/F. Bauer et al. On the one hand, it could be the result of some sort of destructive event, or something scientists have never before seen. The reason for this has to do with the fact that X-ray bursts also come with a gamma-ray burst (GRB), which appears to be missing here. Essentially, GRBs are jetted explosions that are triggered by the collapse of a massive star or by the merger of two neutron stars (or a neutron star with a black hole). Because of this, three possible explanations have been suggested. In the first, the CDF-S X-ray source is indeed the result of a collapsing star or merger, but the resulting jets are not pointed towards Earth. In the second, the same scenario is responsible for the x-ray source, but the GRB lies beyond the small galaxy. 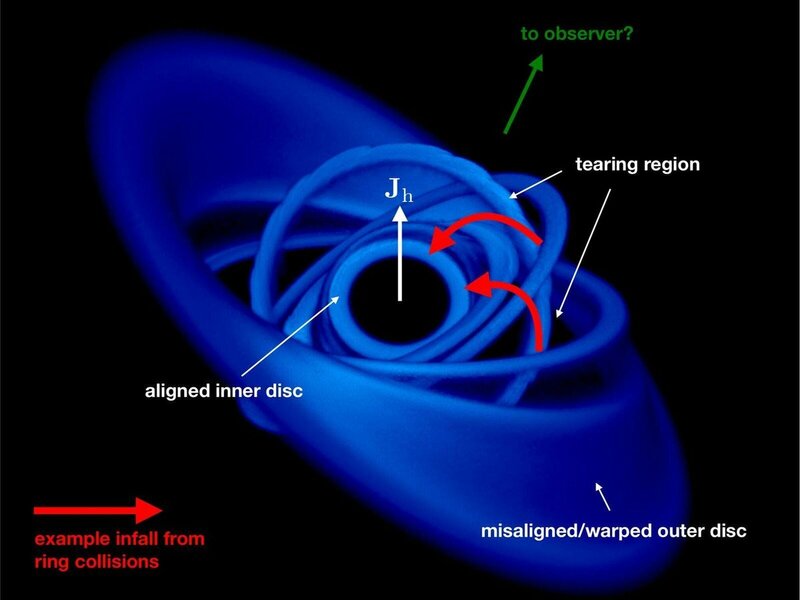 The third possible explanation is that the event was caused by a medium-sized black hole shredding a white dwarf star. Not only has Chandra not observed any other X-ray sources like this one during the 17 years it has surveyed the CDF-S region, but no similar events have been observed by the space telescope anywhere in the Universe during its nearly two decades of operation. On top of that, this event was brighter, more short-lived, and occurred in a smaller, younger host galaxy than other unexplained X-ray sources. Still image of the X-ray source observed by Chandra, showing the captured flare up at bottom Credit: NASA/CXC/Pontifical Catholic Univ./F.Bauer et al. From all of this, the only takeaway appears to be that the event was likely the result of a cataclysmic event, like a neutron star or a white dwarf being torn apart. But the fact that none of the more plausible explanations seem to account for it’s peculiar characteristics would seem to suggest that astronomers may have witnessed an entirely new kind of cataclysmic event. The team’s study – “A New, Faint Population of X-ray Transient“- is available online and will be published in the June 2017 issue of the Monthly Notices of the Royal Astronomical Society. In the meantime, astronomers will be sifting through the data acquired by Chandra and other X-ray observatories – like the ESA’s XMM-Newton and NASA’s Swift Gamma-Ray Burst Mission – to see if they can find any other instances of this kind of event. And of course, future surveys conducted using Chandra and next-generation X-ray telescopes will also be on the lookout for these kind of short-lived, high-energy X-ray bursts. It’s always good when the Universe throws us a curve ball. Not only does it show us that we have more to learn, but it also teaches us that we must never grow complacent in our theories.